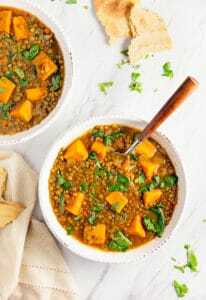 Warm and deliciously fragrant spices make this yummy Moroccan-inspired sweet potato and lentil stew a new family favorite. A fabulous Whole Food Plant Based recipe. Vegan, oil free, sugar free, gluten free, no highly processed ingredients. In a large ceramic/enamel-lined Dutch oven or similar stock pot, add the finely minced onion and carrot; sauté over medium heat until they begin to soften, approximately 4 to 5 minutes. Add a tablespoon or so of water if the onions and carrots start to stick and/or to prevent burning. Add all the other the remaining ingredients to the Dutch oven, except the baby spinach and cilantro, bring to boil, then immediately lower to a simmer. Stir well to incorporate all the ingredients. Simmer uncovered over medium-low heat for 45 minutes. At 45 minutes, push the potatoes over to the side of the pot (as much as possible) and remove approximately one cup of the cooked lentils and place them in a wide bowl. Smash them with a fork or potato masher, then return to the pot. This will give the stew more varied texture. Test the flavors, add more spices (see recipes notes), if necessary, to achieve the level of flavor you desire. Add the baby spinach and cook for another 15 minutes. Top individual servings with freshly chopped cilantro. *Diced Sweet Potatoes: Since the sweet potatoes are in the stew for an hour, do not diced them too small or they will disintegrate. Vegetable Broth/Water Ratio: We use Pacific Organic Vegetable Broth. We love this brand because it is Whole Food Plant Based compliant, as it does not contain MSG, has no oil, and does not contain any highly-processed ingredients; however, this brand of vegetable broth does have a strong flavor so less broth is required when compared to the water ratio. We use a higher water to broth ratio because of this. If you use another brand of vegetable broth, then adjust the water/vegetable broth ratio accordingly. For example, if you are using a very mellow vegetable broth, you might consider 6 cups of vegetable broth and 2 ½ cups of water for this recipe. Please adjust the recipe (broth/water ratio) accordingly based upon the vegetable broth brand used if you are not using Pacific Organic Vegetable Broth. *Spices: You can control the spice level and heat level on this recipe. We have included the minimum spice amount to get a hint of the Moroccan flavors. This will allow you to introduce Moroccan flavors to family members who may have not tried the Moroccan cuisine and would love to experience it. However, if you really want to spice things up, you can easily increase the spice amounts indicated in the recipe, or add additional spices to adjust this recipe to meet your own spice preferences; however, be careful, as sometimes when you add too much spice, the flavors start to compete with one another and you end up with a bitter note to your dish. Add small amounts at a time until you achieve the spice level you love! *Water Amount: Use 7 cups to achieve a more thicker stew, and conversely use 8 cups if you are looking to have a less thick stew. Again, please see the notes on adjusting the broth/water ratio based upon the brand of vegetable broth being used for this recipe. *Nutritional Information: Shows sodium for only 1 tsp of sea salt.